On the other hand, I happened to be standing at the kitchen window today when the wild turkeys came out for a stroll in the hayfield just beyond the garden. I spotted two mama hens with at least 11 baby turkeys in tow (they've gotten much bigger! )**--and as far as I could tell, not a single one of them was digging up or munching down anything of mine at all. It was really quite peaceful. **My apologies for the confusion. I haven't posted a turkey photo--but not for lack of trying. It's just very difficult to get close enough to them. That link above takes you to the post where I previously wrote about seeing these baby turkeys. They're both trying so hard to look innocent. You can almost hear them saying "what? It was like that when we got here." LOLOLOLOL! Too funny. (And nice try.) : ) OMG, I am STILL LOL! The notorious Garden Gang, in the clink! Maybe they can get OJ's lawyer. There isn't a glove is there? Even with folur legs apiece they have that jailbird look. They have to be guilty! Did they ever get out again? Time off for good behavior. What's that? What, who me?? So cute! Is this the naughty corner? Maybe they lose one day of garden privileges for each leg...? Oh, but I DO want to know! "But maaaaaaaa he started it. And you know being a lamb I have that 'herd mentality'. It's innate. I HAVE to be a follower!" Did I miss the turkey picture...? I was going to say what Pendlerpiken said. I actually want all the gory details. Yeah, I would be interested to know just what they did too. And Trish, you're not alone, I also missed the turkey pic. Farmgirl I'm so glad I made you LOL since you do that for me almost daily! Thaank you for sharing your farm and all you're lovely critters with us! Nanny Bear looks really proud of himself. 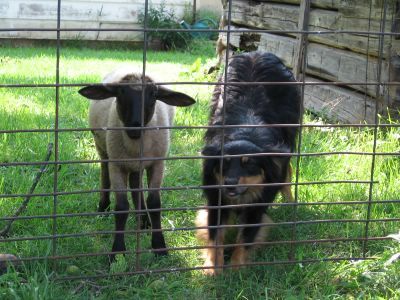 And I'm with ms. dafarm, as we all know collies are expert herders! It's the peer pressure of the animal world. By the way, you have to be the only woman who gets her farm animals to pose for pictures. I'm joining the curious crowd. They *surely* couldn't have been that bad.....they're just too sweet! !